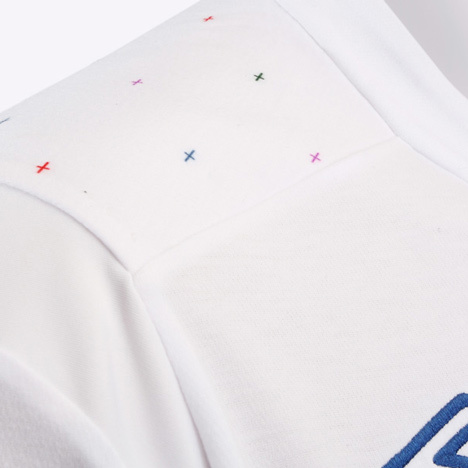 The shoulder panels of the new England football kit feature a fabric printed with small coloured crosses, designed by British graphic designer Peter Saville. The design for sports brand Umbro depicts the St. George's cross in four colours and is intended to represent the country's diverse cultural makeup.The design for sports brand Umbro depicts the St. George's cross in four colours and is intended to represent the country's diverse cultural makeup. The kit will first be worn on Friday when England take on Bulgaria for their opening qualification game for Euro 2012. As England look to the start of their campaign for Euro 2012, we’re very excited to announce a new deal between the Football Association and Umbro, that will see us working together until at least 2018. At the same time, we can also reveal a new home kit that the team will wear as they battle for a place in the finals. Giving the team a fresh new look, the new home shirt builds on the tailored principles behind the previous shirt and the current away kit, using the latest in design technology whilst adding a new, colourful graphic design to the template. So what’s the thinking behind this design? The idea, another innovative approach to football kit design from Umbro, is inspired by the involvement of a true cultural icon in this particular project. Peter Saville – iconic graphic designer and all-round cultural connoisseur – has designed a special fabric print for the new kit, which features on the shoulder panels of the shirt. Saville – who initially made his name through his work with Factory Records, and is now recognised as one of Britain’s leading creative minds – has crafted this design through a consideration of England’s cultural makeup. Inspired by the increasingly diverse fabric of England, the design takes the traditional St. George’s cross and reinterprets it as a reoccurring motif in four different colours – the traditional red, blue and green which feature in England’s three lions crest, plus a blend of all three which comes out as a striking purple. Players names will appear within the fabric, to underline how they’re a part of the fabric of modern England. The shirt itself is inspired by the formal designs in England’s past, combined with the latest in design innovation. Inspired by the idea behind this cultural fabric, we decided to reveal the new kit on a special England team line-up that you can see at the top of the page, made up of some of the best young footballing talent in the country. Alongside established names such as Rooney and Joe Hart, we’ve also picked out players such Jade Bailey, one of the best prospects in the England Women’s team, and Eric Dier, an English teenager playing abroad in Portugal. Together, they epitomise the different ideas on what it means to be English that the new fabric of England represents. Over the next few weeks, we’ll be taking a closer look at the kit itself, the players we’ve chosen and the man who’s designed it, ahead of the shirt going on sale on October 12th. Ahead of that, you can see the kit being worn for the first time when England take on Bulgaria in their opening Euro 2012 game this Friday. Featuring the New Fabric of England graphic design on the shoulder, the shirt also features a new longer, more open neckline, which provides greater movement across the chest. With the traditional England crest and the Umbro double diamond embroidered on the chest, the new England home shirt mixes the best in design innovation with a strong link to our footballing heritage.